Dropbox is rolling out a number of new features aimed at making its business product as easy to use as its consumer version. Smart Sync (formerly Project Infinite) and Dropbox Paper are now out of beta and have been release alongside a redesigned Dropbox web interface. “It’s amazing how far technology has come in the last 10 years, particularly in the consumer realm, in our personal lives,” said Drew Houston, Dropbox CEO, speaking in San Francisco. “But what’s surprising to me, is a lot of this progress hasn’t really made it into our working lives. First introduced as Project Infinite last April and now available to all Dropbox Business users, Smart Sync gives businesses and individuals access to all of their cloud files without having to download them onto their desktop or laptop. The files appear on a user’s computer exactly as any others and work in exactly the same way, while taking up virtually no local disk space until it is needed. It works across both Windows and Mac computers and all different file types. So, you now have constant access to all of your documents, but Dropbox also wanted to “move beyond the document” and that’s where Paper comes in, moving out of Beta mode and now available in 21 languages. Paper is a flexible workspace that enables teams to work together on documents, using text, images, videos and even code. It’s essentially a ‘live’ environment, giving users a real-time view of any changes that have been made. It can be described as Dropbox’s answer to Google Docs and Box Notes. Users can add due dates for certain actions, assign people to tasks and then keep track of the project as it progresses. Team leaders can see who’s currently viewing file, who viewed it recently and, perhaps most importantly, who hasn’t viewed it yet. Other new features also include a presentation mode, improved search functionality and smart meeting notes with Google Calendar integration. 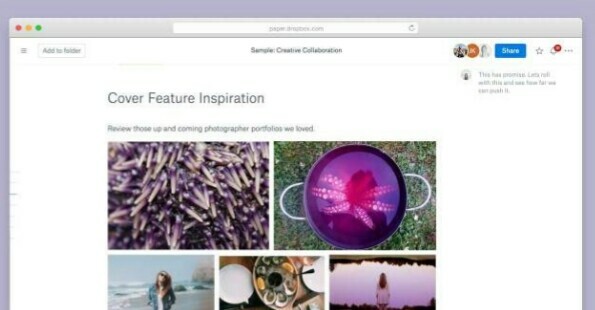 As well as the product updates, Dropbox revealed a new design to its web interface, aimed at helping user to stay focused on tasks while providing easy access to relevant and related content.